There are some good vibrations going on at NTS Fullerton. After months of construction and streamlining our Dynamics Department is operating in a state-of-the-art facility. The newly constructed building incorporates a 16 ton crane and efficient open floor space. This floor space allows for customizable dual-shaker setup for the testing of over sized items. Using C220 shakers and the 16 ton high powered crane the dual-shaker setup can put out a combined 70,000 force pounds. Staged on a versatile platform with a 500,000lb reaction mass the Dynamics Department houses nine Electrodynamic Shakers including two MB C220, four UD T1000, one UD T4000 and one UD T2000 with test capability ranges up to 32,000 lbF, 3,000 Hz and displacement ability between 1” to 3”. There are also three hydraulic shakers including a TEAM Hydraulic shaker capable of 12,000 lbF and up to 500 Hz and two Windmilling Hydraulic Shakers capable of 3,000 lbF and up to 50 Hz. We also feature a multitude of Drop Shock towers ranging from 8 feet to 40 feet high. Of course, none of this would be of any value without the right support equipment. 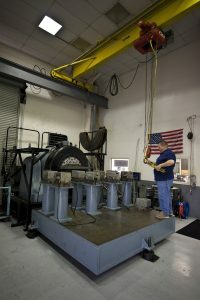 NTS Fullerton has invested in various vibration and shock controllers to support a wide range of test situations. With Spectral Dynamics Jaguar controllers and Spectral Dynamics 255X controllers the Dynamics Department has the ability to support anywhere from a 4 channel up to a 64 channel reading. NTS Fullerton prides itself on being able to execute testing and engineering programs with focus and excellence. Being willing to customize solutions to support your unique product design is key to achieving that goal. NTS Fullerton maintains a SEA compliant in-house machine shop, design engineers and partners with industry leading precision machining companies to ensure that each program is complete from planning to execution to reporting.